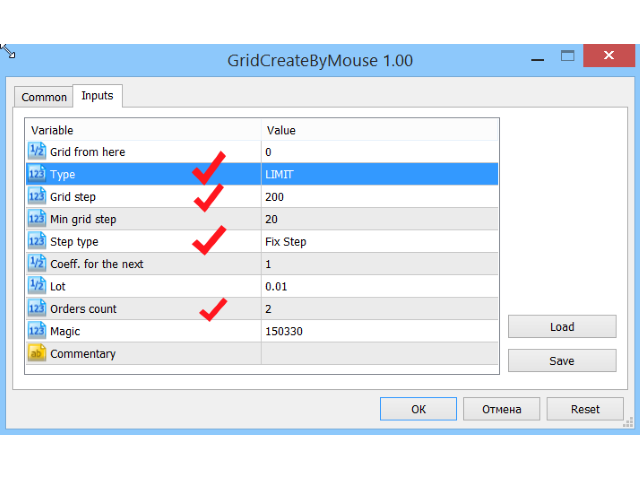 The script allows to use the mouse for placing a grid of orders with fixed or variable step quickly and with as few mistakes as possible. 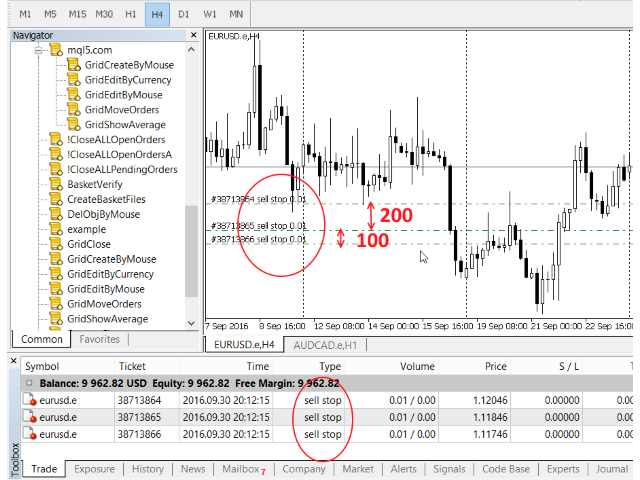 Drag the script to the chart using the left mouse button and release. The grid will be plotted starting from that point. If the current price is lower than the grid start point, the grid will be placed "to the north" towards the buys, and if higher - towards the sells, "to the south". Setting take profit and stop loss is left to trader's discretion. Grid from here - in case this field in not zero, the grid will be plotted starting from this value. 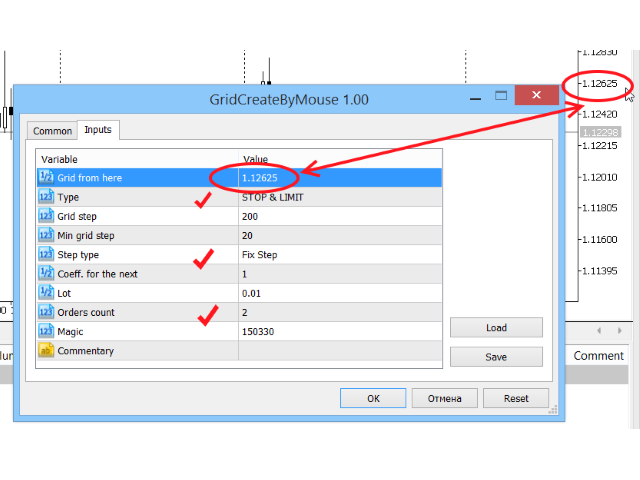 If it is zero (default value), the mouse release point will be used as the start for the grid. STOP & LIMIT - grid in two directions. At the order opening points two orders are opened at the same time - STOP and LIMIT. 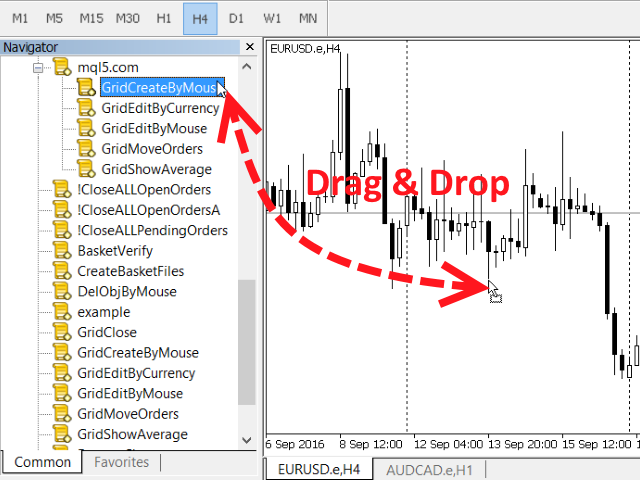 The script automatically chooses between BUY and SELL, based on the location of the grid relative to the price at the execution time. The default value is LIMIT. Grid step - the distance between orders in points. The default value is two hundred (200) points. The value is given for a five digit broker. It should be manually set ten times less for a four digit broker. Min grid step - the minimum grid step in case the variable size of the step is set, and if the grid is plotted with a decreasing step. The default is twenty (20) points. The value is given for a five digit broker. It should be manually set ten times less for a four digit broker. FIXSTEP - fixed step size, equal to the Grid step. VARSTEP - variable step size. The first step of the grid, i.e. the step between the second and first order, will be equal to the Grid step. Each subsequent step will be equal to the previous one multiplied by Coeff. next step. The default value is FIXSTEP. Coeff. next step - the coefficient to calculate grid step value, in case it is plotted with a variable step size. In this case, the first step is equal to Grid step, and the subsequent ones are obtained by multiplying the previous step by this coefficient. If the coefficient is set to less one, and the grid is plotted wit ha decreasing step, then the minimum step value is taken equal to Min grid step. Once the newly calculated step is less than or equal to the Min grid step, grid plotting stops. The default value is 1. Lot - the volume of opened orders. The default value is 0.01. 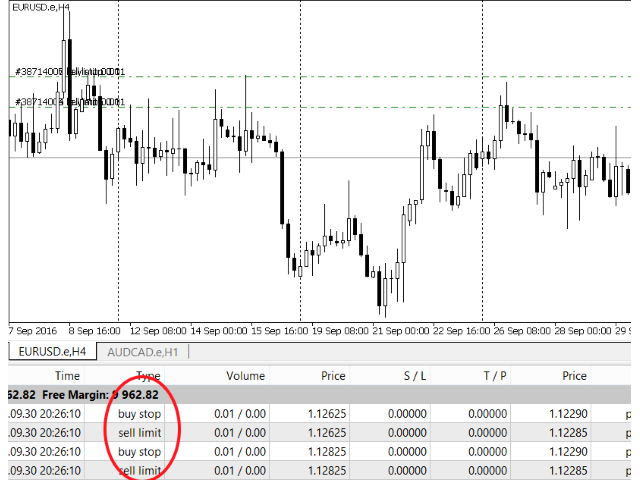 If it is less than the minimum allowed, the value of the Lot parameter is taken as the minimum allowed volume value for the broker. 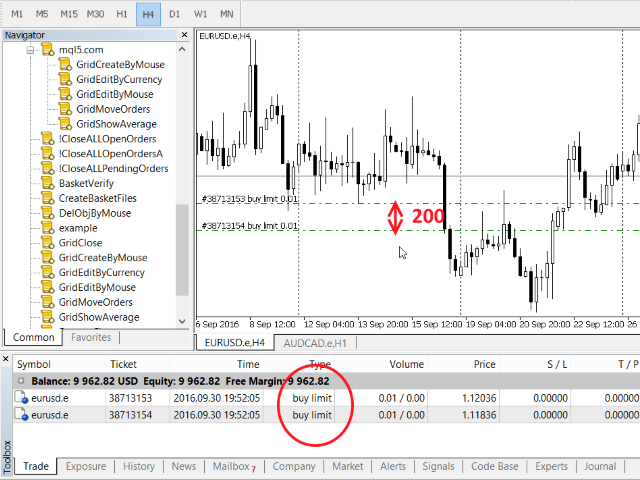 Orders count - the maximum number of price levels, where orders are to be opened. The default value is four. For this value and for the TYPE parameter set to STOP & LIMIT, the grid will consist of eight orders, and for other values of the TYPE parameter - four. Magic - magic number. The default value is 150330. Commentary - comment to orders. By default, the value is not specified and there are no comments. Fixed inaccuracies detection during the operation.